Dr. Bhullar successfully completed an accelerated undergraduate and dental degree program through the University of the Pacific in San Francisco, which allowed him to obtain his DDS degree in six years following high school. 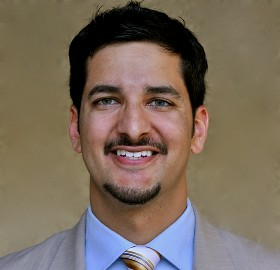 After receiving his dental degree in 2003, Dr. Bhullar practiced all phases of General Dentistry for four years. With an exceptional interest and appreciation for endodontics, Dr. Bhullar pursued his specialty certificate from the University of Southern California under the direction of Dr. James Simon, past Director and President of the American Board of Endodontics. Throughout his education, Dr. Bhullar has been recognized for academic, clinical, research, and community excellence with numerous awards and distinctions, including the Dean’s List, the Delta Dental Scholarship and 2nd prize at USC’s 2008 annual research day. In addition to private practice, Dr. Bhullar has given presentations on current endodontic topics at Marquette University and the University of Southern California. He has also provided hands-on courses for dentists through local study clubs. Dr. Bhullar is a proud affiliate of the American Dental Association, California Dental Association and American Association of Endodontists as well as a member of the Contra Costa County Dental Society. He was awarded Board-Eligible status by the American Board of Endodontists in 2009. While away from the office, Dr. Bhullar enjoys playing tennis, basketball, traveling, eating (always eager to get a tasty recommendation!) and spending time with family and friends.